Shelters provide safety and comfort from heat and cold, and well as from physical threats like the sun, rain, snow, sand or animals. Shelters should be found or constructed away from potentially dangerous areas such as flood zones, lightning strike zones, avalanche areas, and on pathways. While there should generally be insulation, be sure there is adequate ventilation as well. If you don’t carry provisions for this purpose, you’d be surprised what materials at hand can do in a pinch. The following shelters may open your eyes to some possibilities. Organic debris is layered on a “lean-to” frame against the tree. In this case I used redwood needle debris and had only time for about a 6 inch layer. It was slightly drafty. A 2+ foot layer is better, and deciduous leaves would most probably provide better insulation. Be sure to pad the ground well to prevent hypothermia. I spread laurel (bay) leaves on the ground as well to deter ground critters. 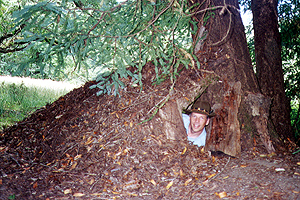 Check out the Debris Shelter Gallery to view the process. 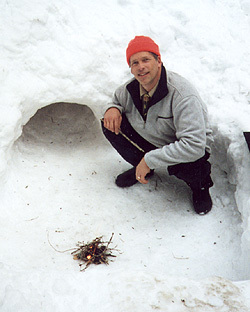 You can dig down about 4 feet deep, then dig horizontally about 6+ feet to create a simple snow shelter. because the snow is not packed, expect some settling, so head in feet first. You’ll need insulation to sleep on. It’s also handy to have a sealable container on hand in the event that if nature calls in the night… you won’t need to take a disruptive and cold trip out. Pile snow 6 feet high and pack as you go. It helps if you can pile your gear with a tarp over it at the core, so when you tunnel in, they can be removed, leaving an open core. A sloping entry with flap will form a cold air well. Try to smooth the ceiling to prevent drips, and fashion a gutter at the base of the walls. Also, put in a vent hole big enough to put your arm in. It is sooooo quiet. And during daylight hours, the walls inside are a beautiful blue. This lavvu tent is native to the Sami people (a.k.a. – Laplanders). 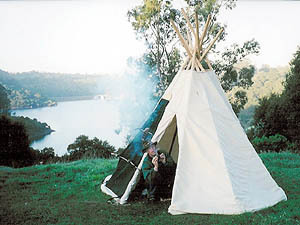 It is similar to a tipi, but has no smoke flaps or seams to fasten. Because there is no floor, you can have a campfire inside for warmth, cooking, or atmosphere. This model sleeps 3 plus a campfire in the middle. This is a Hennessey Hammock. It is expedition class, and enters through a Velcro slit under my legs. 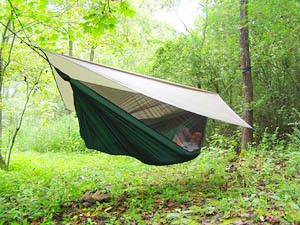 Long sleeves pull over the rolled up hammock to create a long rope-like package to stuff in your pack or bag. 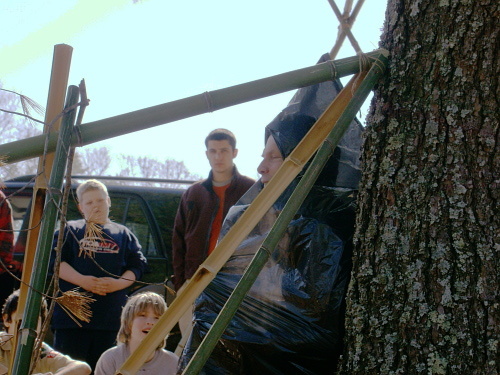 A shelter could mean using a trash bag as a portable tent that a person could sit in. I like to invert a bag and hold it up by one corner. Then about a foot down, I make a 2 inch cut on the folded edge, which makes a 4 inch wide hole when opened. I lift the bag over my head and let it cover my body, placing my face at the hole. I can turn up the upper edge like a rain gutter. The inside of the bag reflects heat back to my body and the outside keeps out rain. Find a tree and squat down at the base, leaning back on the trunk to rest. 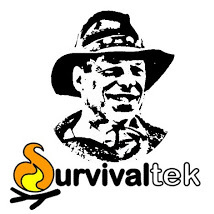 I demonstrated this technique in the Emergency Shelter Class for a Boy Scout Camporee. Thanks for the info. I’m glad to find this site. This will all be important stuff for us to know sooner than we think I’m afraid. Soooo helpful! Won’t the trashbag shelter get wet inside due to condensation from the breath & from it being wet on the outside? Doesn’t there have to be some spacers, so air can circulate between the bag & the clothes, so the condensation doesn’t soak the person? How many hours have you tried this bag out in, in the rain & in the cold? Does it really work? The trashbag shelter is intended for emergency situations and not as a standard shelter. Condensation could be a slight problem but would certainly be better than becoming drenched in rainfall, and it helps to capture body heat. I had a friend who used this method on a biking trip when he got lost on a trail at nightfall.